Phytomedicine, Biochemical Toxicology and Diabetes Research Laboratories, Department of Biochemistry, Afe Babalola University, Ado-Ekiti, Ekiti State, NIGERIA. Background and Aim: In Africa, the fruit, seed, leaf, and stem of Blighia sapida K.D. Koenig are used as remedy for a range of diseases. This study characterized the phytochemicals, assessed the antioxidant and inhibitory properties of the stem bark of Blighia sapida. Materials and Methods: Samples were consecutively extracted using ethanol solvent and investigated for phenol content, DPPH radical scavenging abilities, iron chelation, reducing power, α-amylase and α-glucosidase activities as markers of in vitro anti-diabetic activities. Phytochemicals were analyzed using gas chromatography-mass spectrometry (GC-MS) analysis. Results: The extract had radical scavenging capabilities, iron chelation and reducing power. 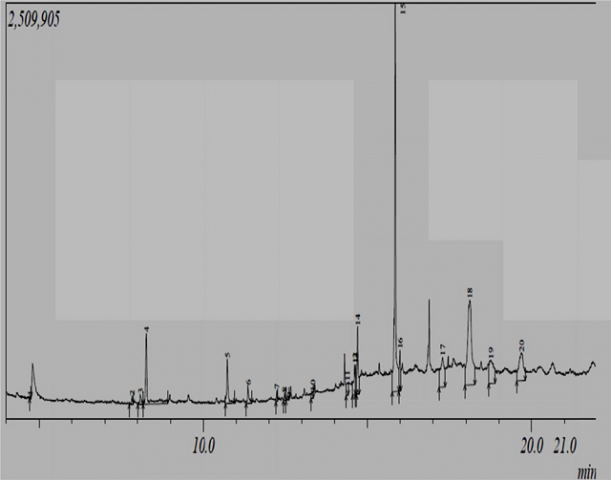 Furthermore, the results reveal the extract had considerably high α-glucosidase and α- amylase inhibitory activities as the concentration increases with IC50 values of 4.17 ± 0.24 mg/mL and 5.30 ± 1.25 mg/mL, respectively. Enzyme kinetic studies indicated that the extract displayed uncompetitive inhibitor for α-glucosidase and was a competitive inhibitor of α-amylase. The ethanolic extract is rich in several aromatic phenolic compounds and long chain aliphatic acids. Conclusion: These results reveal the bark possessed antioxidant as well as α -glucosidase and α -amylase inhibitory activities. Ojo OA, Ajiboye BO, Imiere OD, Adeyonu O, Olayide I, Fadaka A. Antioxidative Properties of Blighia sapida K.D. Koenig Stem Bark Extract and Inhibitory Effects on Carbohydrate Hydrolyzing Enzymes Associated with Non-Insulin Dependent Diabetes Mellitus. Pharmacognosy Journal. 2018;10(2):376-383.